He demonstrates spattering, blending backgrounds, painting horizons, finger painting clouds and foam. There is expert advice on the anatomy of waves and how they rise and collapse, creating ripples, surf, foam and spray. Clear instructions show how to paint effective reflections and beaches to improve your seascapes. The sky section shows effective techniques for painting all types of cloud, with some innovative methods such as tipping up the surface to let dilute paint run, to create cirrus clouds. 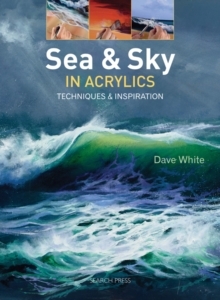 Dave's method of creating depth in sea, beach and sky using lines projected from the vanishing point will radically improve readers' seascapes. There is a section of moods and sunsets full of beautiful, dramatic examples. Finally three step by step projects show how to paint a beach panorama with a rolling wave, a spectacular sunset over a calm sea and waves crashing on rocks.